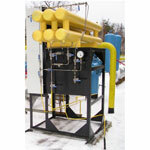 The modern system of distribution of natural gas and LPG requires adding a specific smell to gas (odorization). Odorant submission must be done in strict proportion to gas consumption, as an excess or deficiency of the odorant in the gas is dangerous. For this reason, high requirements exist towards the exactness in delivery, safety and reliability.